Integrated Pest Management | Our Farm by Earth Flora Inc.
Don’t mess with adorable ladies in red and black polka dresses. They are quite fearless. In our farm, they have taken on the heroic task of battling aphid colonies, which feed on our young leaves, new shoots and baby buds. Don’t let their tiny bodies deceive you because lady beetles are ravenous! They eat up to 1000 aphids a day. Even as larvae they can eat 500 aphids! And mind you, they do it by stabbing the nasty aphids with their mandibles and sucking out the juices. 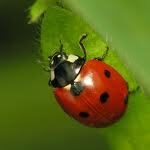 It is no wonder why the ladybug in ancient times, symbolized good fortune and a bountiful harvest. One fun trivia about lady beetles: In times of danger, ladybugs are able to roll over and play dead. Recently moved in are the stingless wasps (Trichogramma). These are tiny insects of about 1 millimeter and they control at least 28 species of insect pests. These wasps are one of the smallest insects on the planet. We released 10,000 wasps and they are now roaming about our farm, parasitizing pest eggs. Our wasps are busy “sowing their seeds” into the harmful eggs of caterpillars and moth (the leafeaters,) among others. When the wasps hatch, the larvae will devour the pest egg contents. During their 9-11 day lives, the wasps will seek out and destroy about 50 pest eggs by laying their eggs into the pest eggs. I know it reads like a horror movie but these are naturally occurring in nature. A trivia about wasps: The adult females use their antennae to measure the size of the host egg in order to determine how many eggs to lay in it. These are just some of the biological controls we use in the farm, as part of Integrated Pest Management. Biological controls eliminate the overuse of chemicals, increasing biodiversity. Our farm is blessed with ladybugs, lacewings, and most recently, are now the happy hosts of stingless wasps. Our friendly neighbors are beneficial insects who pay their rent by ridding our farms with pests while compensated with an abundance of good pests to eat.